We all know that many new trends start on the West Coast and move to the East Coast. Thanks to my recent visit to San Francisco I became aware of a couple of drinks that seem to be everywhere we went out there. For some of you these maybe know drinks but I can't say that I have seen these in our area. The first is Kombucha. I have know about it from my daughters but I didn't realize how popular it was until visiting San Francisco on a recent visit. 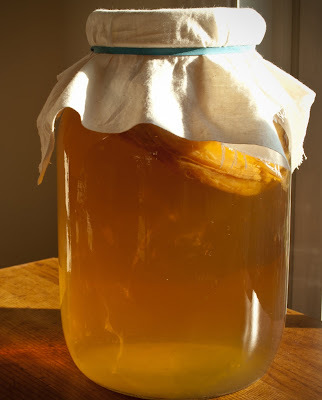 For those not familiar with Kombucha it is fermented tea. One maker has the slogan " Get tickled not pickled." 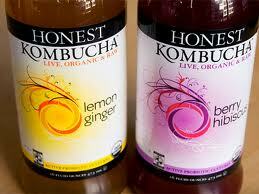 Many drinkers of Kombucha believe it has health benefits with detoxification of the liver. It is often used with food cleanses and fasts. While the health benefits are in dispute it definitely has a taste that is unique. It has some alcoholic content ( about 5%) based on how long it is fermented. It has a strong acidic taste almost like a sparkling drink. Out West bottles like those above were sold everywhere, even in gas stations in the cooler next to the sodas. Around here natural food stores and Whole Foods is probably the best place to look. The second drink that seemed to be everywhere was cucumber water. The glass above has some pureed cucumber in it for a stronger flavored drink. 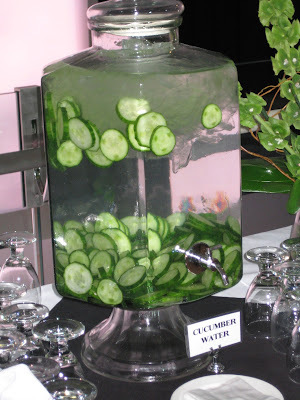 Often the sliced cucumber was placed in a pitcher of water, like above, that had a milder flavor. I got hooked on this drink and the joke became that I was going to start to have a green tint to my skin by the time I left. The way I liked it best was with some slices in ice tea. The flavor was better than lemon or mint in ice tea. It is also very easy to make at home and I have been making cucumber ice tea ever since I have come back. 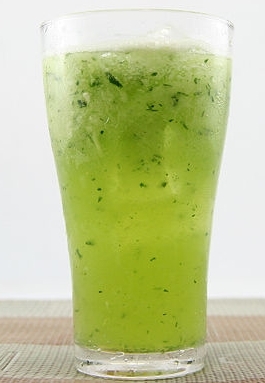 If you have a Labor Day picnic planned try making some cucumber ice tea. 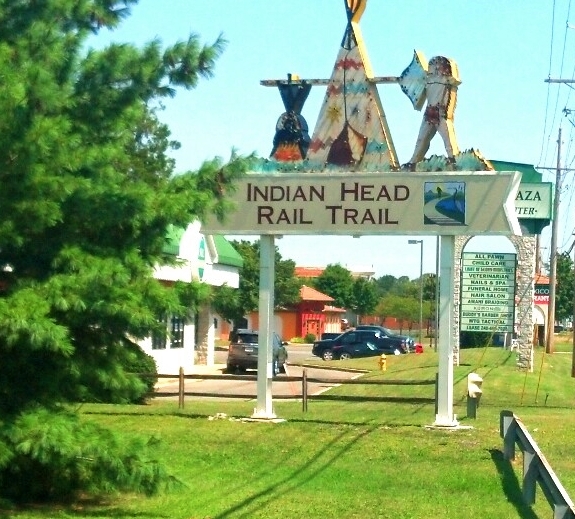 This past week I had a chance to ride one of the best rails to trails bike path in the Baltimore/Washington area. 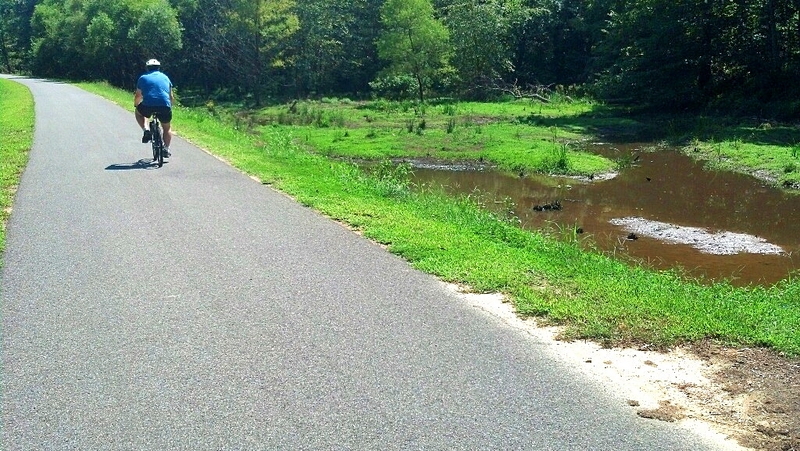 Charles County Maryland has created a 13 mile bike path that follows the Mattawoman River as it goes through the County. 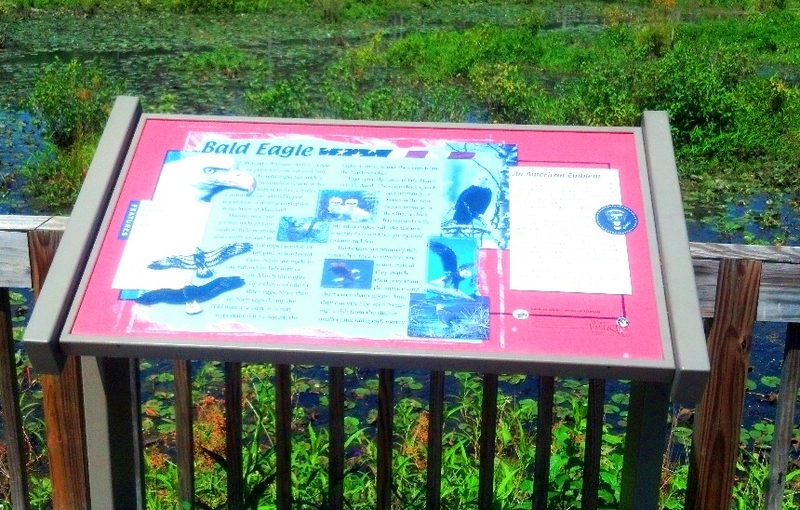 This bike path provides many viewing points along its marsh areas to watch an amazing amount of water fowl and even bald eagles as the information board below shows. The area below with its dead trees provide a perfect perch for bald eagles and hawks to watch for food. The river has created many marsh areas along the ride. The best way to get to the trail is to follow Route 301 to Waldorf and look for the sign above that directs you to the turn for the beginning of the trail. There is a large parking area at the beginning of the trail with bathrooms and a shelter to eat a packed lunch. There is even a misting pole if you are hot from the ride. As a reminder of what the trail was once a caboose from the railroad era is in the parking lot. 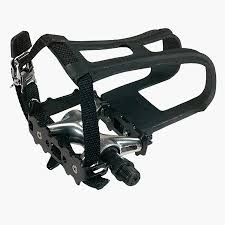 I finally broke down and bought some clip on bike pedals and shoes this week. 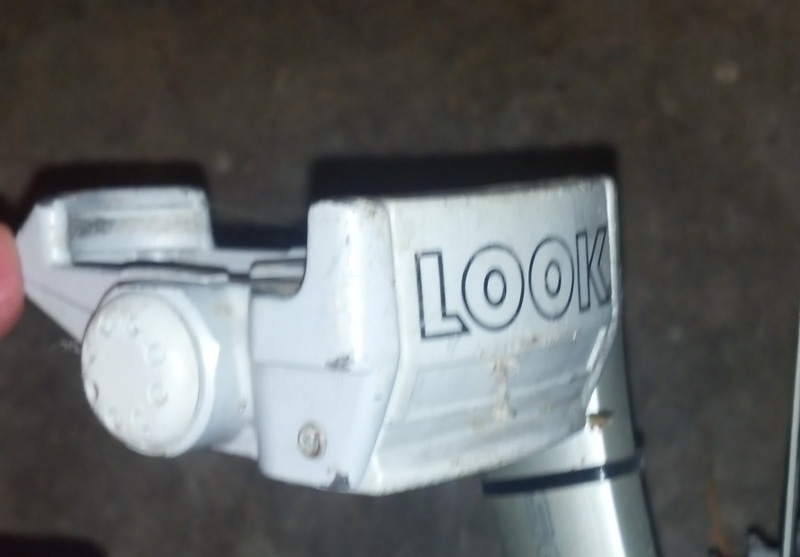 I have been using toe clips on my pedals for over 30 years. Needless to say it takes some getting used to. My first 10 minutes of practice with the toe clips ended with two easy falls on a straight part of the bike path behind my house. No a nice feeling to be falling over while desperately trying to unlock your foot from the pedal. Only a slightly bruised shin and hip. I have blogged before about how important it is to bike safely on our bike paths. This week showed how important this is. I was running on the path from Lake Elkhorn to Savage and a biker came around a blind downhill curve at a fast pace. He saw me and slammed on his brakes and lost control of his bike. To make matters worse the path was wet from a light rain. The biker rolled off his bike and landed at my feet. He seemed more startled than injured. I can only wonder what would have happened if I had been on my bike or if a child had been on a bike instead of me running. 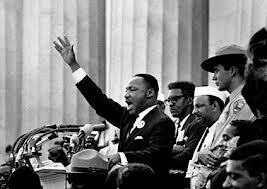 Yesterday marked the 50th anniversary of the 1963 March on Washington. I thought it might be helpful to have a little historical perspective to understand the climate of the times in 1963. The date of August 28th was chosen as the eighth anniversary of the murder of Emmett Till who had been murdered for talking with a white woman. In those days in the South that was something that could get you killed and the murderers didn't have to fear prosecution. 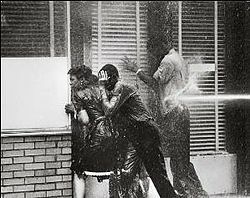 That Spring peaceful demonstrators had been treated to water hoses from the Birmingham Police Department. 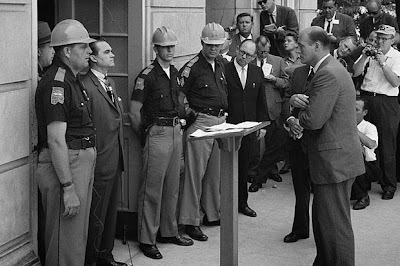 This effort caused the general white population of the country to examine the brutal force that led to calls for new civil rights legislation. In June a court ruled that two black students had to be admitted to the University of Alabama in spite of Gov. George Wallace trying to stop their admission by standing in the doorway at the University. Two months before the March Medgar Evers, the Field Secretary for the NAACP in Mississippi, was murdered and it took 30 years to bring his murderer to justice. A couple of weeks after the March in Mississippi four young girls were killed in a church bombing. This was the backdrop to the March that occurred on August 28, 1963 and was the setting for the "I have a dream" speech of Martin Luther King. Take some time to listen to that link. I wanted to also post two links to his other great speeches, "I have been to the mountaintop", his last speech and his "How Long" speech. It wasn't hard to miss what was missing at yesterday's march. At least they had a statue to represent them. I came across this Lincoln recreator giving his Gettysburg Address in the voice that was as it sounded by persons who have described it. Hard to believe someone sending you a gift card to a merchant you don't use or that you would have preferred cash but I suppose it happens more often than we think. Recently I had a chance to talk with Carrie Brenner who works with marketing an Ellicott City based internet business that buys and sells gift cards that people don't want. The business is called Gift Card Rescue and it will buy your gift card for up to 90% of its value and either send you a check or give you an Amazon gift card. The popularity of the merchant determines the value of the card. Gift Card Rescue also sells gift cards at a discount so it knows what merchant cards are in demand. Gas cards and Walmart are two of the most popular. This business was started by Kwame Kuadey, an Ellicott City resident, in 2007. He received national attention on Shark Tank an ABC show that matches investors with start up business. Even though he did receive two offers from investors he ultimately decided to stay independent. Kuadey's story is remarkable when you realize that he was born in a small town in Ghana and only came to the United States to go to college and then to work with Citi Group. After losing his job at Citi he decided to work full time on Gift Card Rescue. They presently operate out of a small office space near the Court House in Ellicott City but with continued expansion and hiring they may have to soon locate larger space. Jobs with this company center around the processing of gift cards, customer services and marketing. Recently it was listed in INC magazine as having the 151st fastest growth in the country in the past 3 years. A remarkable 2,500% increase in revenue over the past 3 years from $250,000 to over $6 million. Here is how it works. You go online to their website and enter the information on the card you have and learn how much they will pay for the card. You then send them the card and after they receive the card you will be sent your check. You get an Amazon gift card in an email usually in a shorter timeframe. The benefit of buying a card from them is that you get the card at a discount based on the popularity of the card. Less popular cards get bigger discounts. Lane Bryant cards are at a 20% discount and Walmart cards go for a 2% discount. Many of the cards are for odd amounts which would seem to indicate they were for merchandise returns. To combat fraud of people selling stolen cards they red flag cards with recent purchase dates, sellers with a large number of cards to sell and cards with high values (like $5,000). Merchandise shoplifted is often returned for store credit. If a seller is red flagged further proof of their legitimacy maybe required. This may include a copy of a drivers license or a receipt for the card. Needless to say this concept has others offering this type of service. A Google search showed Gift Card Rescue as the fourth listed service. Internet businesses can be some of the riskiest and short lived business out there. Today's huge success is tomorrow's failure. Even though the business is locally housed the marketing for the business is mostly online marketing through Facebook and other social media (like blogs!). While the focus of the business is not local they have become involved in local efforts for the YMCA 5k Run and Downtown Ellicott City. This is an example of how Howard County is fortunate to have talented individuals living here and growing new businesses. Check them out if you get a card you don't want or want to save some money when making you next purchase at a wide range of merchants. 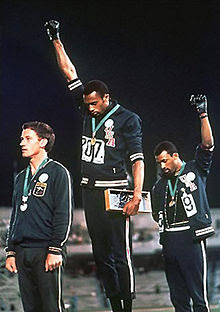 If you are old enough you might remember the black power protest of Tommy Smith and John Carlos at the 1968 Olympics in Mexico City. Next years Olympics in Russia will probably be the platform for another protest this time for gay rights. Russia has recently passed a law to banning ""propaganda of nontraditional sexual relations around minors." Scenes like the one above from Getty Images at a recent World Track Championship might be repeated at the upcoming Russian Olympics. While gay activists discuss how to organize the protests, the world's attention on Russia during the Olympics will prove to be an awkward moment for the increasingly undemocratic rulers in Russia. The "glasnost" period of Gorbachev and Yeltsin is in the past as Russia returns to a the political repression of the old Soviet Union. It should be entertaining to watch as the world's athletes give the Russian government and their policies a "thumb in the eye" next year. For those who are calling for a pull out of the Winter Olympics next year it should be remembered how Adolph Hitler and his racist policies was embarrassed by the athletic success of Jesse Owens at the 1936 Olympics. Additionally the boycott of the 1980 Olympics over the invasion of Afghanistan only hurt the athletes and didn't have any impact on their policies. With this week's start of another school year it seems like a good time to think about how school districts are building for future capacity. This morning's Baltimore Sun had an article about a $1 billion dollar Baltimore City plan for school renovation to upgrade their system's buildings. Is this a smart investment for a cash strapped city? I was reminded of a recent conversation with a relative in Pennsylvania who told me that their local school district was facing the possibility of bankruptcy. I had never heard of something like this and inquired why this was necessary. It seems that their school district had lost many students and the teacher contracts couldn't be changed to reflect the loss of revenue from the State of Pennsylvania. The only way to undo the contracts was to declare bankruptcy. Knowing that this area had seen a boom of jobs related to the gas fracking in their area I asked why the number of students was dropping. It seems that more students were being homeschooled on the computer. Once this was something that was centered on religiously minded families but now it was becoming more common in other families. Pennsylvania has been on the cutting edge in being willing to pay for the cost of having students learn at home. One educational vendor, Connection Academy, has been certified in Pennsylvania to provide learning from kindergarten to high school. They buy the computer and pay for the internet connection. Their tuition is paid by the State. This made me start thinking what if this were to become more common in our area? Will the new schools in Howard County being planned or built now become obsolete in a short time? Will these school buildings go the way of the retail bookstore closings of the recent past? Will Howard County be looking at underutilized school buildings in 5 or 10 years? Will our school buildings be dinosaurs in the future? If you think this wouldn't seem possible just think what you would have thought 10 years ago when someone said that the Post Office, bookstores and newspapers would be at risk of extinction in 2013. Why wouldn't this be the method you would choose when you could have your child educated no matter where you lived? I know there are socialization and other reasons why children benefit from our present school model but groups of home internet based families could provide this socialization without the school buildings. Just as the overhead of operating a bookstore has been threatened by Amazon, the overhead of building and maintaining school buildings maybe in danger as the internet based teaching model matures. It's the weekend and time for a little bizarre cooking lesson. Thanks to NPR for directing me to this strange cooking method for cooking in the dishwasher. Most creative cooking method since cooking your dinner on the car engine. Why turn on your oven today to make Sunday dinner? Do ducks really take to water?? The old phrase "Like a duck to water" will have a new meaning after watching this video. Get out and enjoy the weather this weekend. 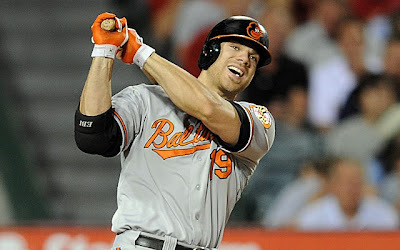 One of the fun aspects of watching the Orioles this year has been the long monster home run shots of Chris Davis. It is hard for athletes playing on Baltimore sports teams to get national attention. Mediocre players in New York or Los Angeles often get more attention and endorsements than Baltimore superstars. That's why it is nice to see the attention Davis has been getting this year. Chris will be signing autographs at the AT&T store today from noon to 1 pm today. The Columbia Patch says that the first 200 persons in line will be guaranteed to get an autograph. All I know is that the line will start forming early today and the usual congestion around noon at Dobbin Center should be ridiculous tomorrow. Make a note to avoid Dobbin Road mid-day today. You have been warned. Who said the rich aren't different than the rest of us? A couple of days ago driving on the Baltimore Beltway while listening to a NPR radio report on the dangers of texting while driving I came up on a car that was driving slowly. This slow car was causing the cars behind it to have to move to another lane. When I got to the car and moved over to another lane I could see why the car was going slower than the other cars on the road. The driver was texting on her phone with both hands off the steering wheel and was steering with her knees! On the Baltimore Beltway! Twice glancing at her during the 5- 10 seconds I was beside her she had her head down looking at her phone and not at the road ahead of her. Multi tasking in the office may have become a way of life but it was a little scary to see this on the road. A recent Baltimore Sun article discussed the results of the most recent advanced placement test results for Maryland and each county in Maryland. Not surprisingly Maryland was the top scoring state and Howard County was the top scoring county in Maryland. This result shows the high performance level of the students in our school system overall. While all the county high schools are above average in most areas tested there are some areas that reflected some differences in the student populations across the county. River Hill and Centennial not surprisingly tested the highest and the Columbia high schools of Long Reach, Hammond, Oakland Mills and Wilde Lake tested the lowest. The range of testing for college preparedness ranged from a high of 64% at Riverhill to a low of 27% at Hammond. County high schools all ranked in the top sixth out of almost 240 Maryland high schools tested with River Hill scoring number 7 out of the 240 schools. Fuller report from HoCo School System. Where is obesity rate going? Recently I saw a report from the Robert Woods Johnson Foundation on the rate of obesity in children that indicated a drop in obesity in children over the past 3 years. Is this trend a short term improvement or the signs of the a recognition that obesity is one of the most important health challenges we face as a nation? Certainly the effort of First Lady Michelle Obama has given childhood obesity national attention to this issue. Amazingly this effort has been mocked by the political right. Remember Sarah Palin serving cookies at a campaign stop? Locally the Horizon Foundation has launched a campaign on this topic too. The challenge will be how to sustain this effort into long term changes in lifestyles to keep the trend going down. This maybe important in Howard County but the bigger need is in other areas of this Country. In discussing this with some friends this week we took bets on whether we would have more obesity 20 years from now than we do now. The majority bet that we would have more obesity. The general belief was that the increase in consuming processed foods, fast foods and the more sedentary lifestyle were factors unlikely to decline. While some of our population was becoming more aware of how to eat healthy and buying organic foods, the general sense was that for much of our population the availability of healthy food choices was limited and that advertisements still led consumers to unhealthy choices. The general sense of the group was that the level of education was probably the factor that defined how healthy a person ate. This certainly seems to true when you look locally at our available food choices. With the completion of our Whole Foods store next year joining David's Natural Foods store and MOMS consumers in our area have easy access to natural and organic foods. I doubt if these food choices are available in Appalachia, inner cities or rural areas of the South. One of the things I love about San Francisco (and probably California too) is that what starts there many times reaches the rest of the country in a few years. I remember first seeing rollerblades in California back in the 1980's and wondering what they were. A few years later I was rollerblading around Columbia. As an aside, the Mid-West and the South seem to be the last ones, if ever, to adapt to new things. 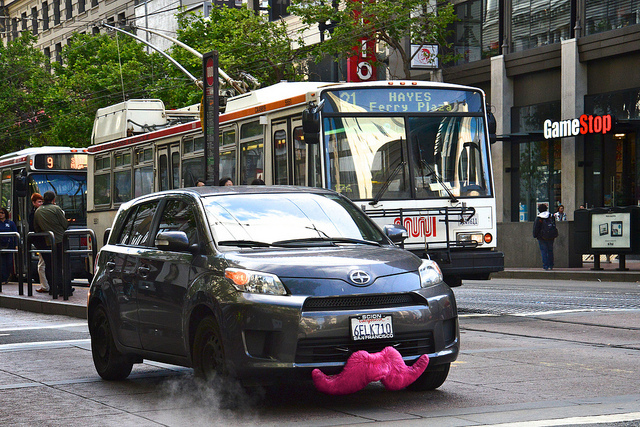 On my recent visit to San Francisco I started to notice these cars driving around with pink mustaches on the front. I finally asked my daughter what they were for. She explained that it was a taxi service called Lyft that used private vehicles as taxis. These taxi drivers were college students and some unemployed people who wanted to make some money. The drivers have through DMV and criminal background checks and are insured for $1 million dollars of insurance. Most innovative about this system is how the fare is charged. Ride arrangements are made through a smartphone app and the price for the ride is negotiated between the rider and the Lyft driver. The ride describes the ride requested and a price they are willing to pay and the first available driver agree to provide the ride at that price gets the ride. While the California regulators of taxis has said this service is illegal, it is unclear whether this is a service that would fall under the taxi regulations. This is another example of how the digital age has threatened another traditional business. Are we looking at the future death of traditional taxis just as we have seen the demise of bookstores and newspapers? Maybe there are some solutions to our transportation needs in Howard County that might use some new technology. Maybe the buses that we have are an inefficient model to meet our mass transit needs. Are there newer digitally driven ways to meet our transportation needs that don't try to adapt mass transportation models that were designed for larger cities. There will always be the question of how to design transportation models for an area like Columbia and Howard County where we are not an urban area large enough to efficiently use the traditional mass transit models. We have seen other examples of how the internet has put some power back in the hands of consumers. Lending Tree for mortgages and Car Direct for buying a car are just a couple of examples. While not parallel locally we have seen how a service like NeighborRide has provided a service to seniors that is more convenient and less costly than taxis. I came across this quote and wanted to pass it along. 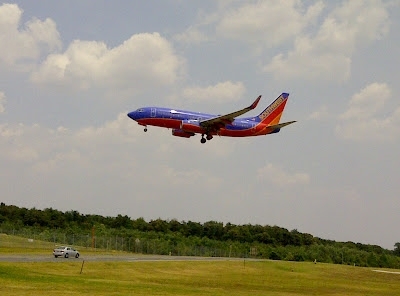 For a very different bike ride the 10 mile loop around the BWI Airport is a great way to view the airport from many different perspectives. Starting at the parking lot of BWI viewing area off of Route 176 the biking route winds around the perimeter of the airport. 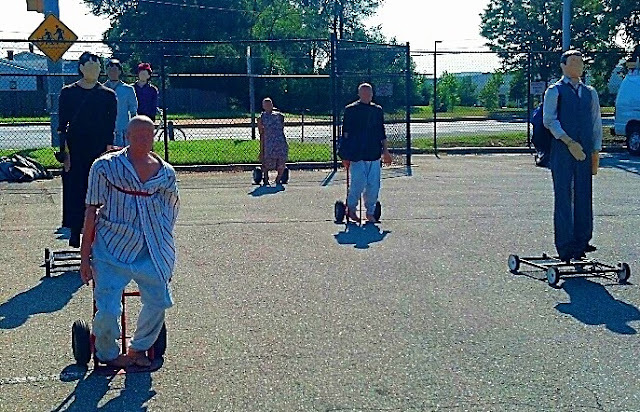 By the Maryland Transportation Office these strange manikins are supposed to represent something but I an not sure what. After going around the airport you can continue on the B and A bike trail to make the ride about 30 miles. We don't always appreciate how the bike paths in Columbia were designed to not cross major intersections. 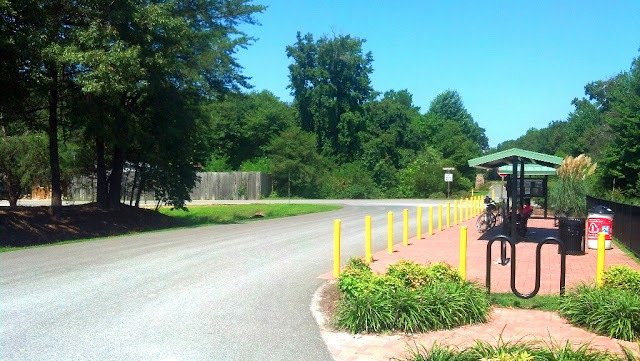 I can go from Savage Park to the Columbia Athletic Club, a ride of about 10 miles and only have to cross two streets. 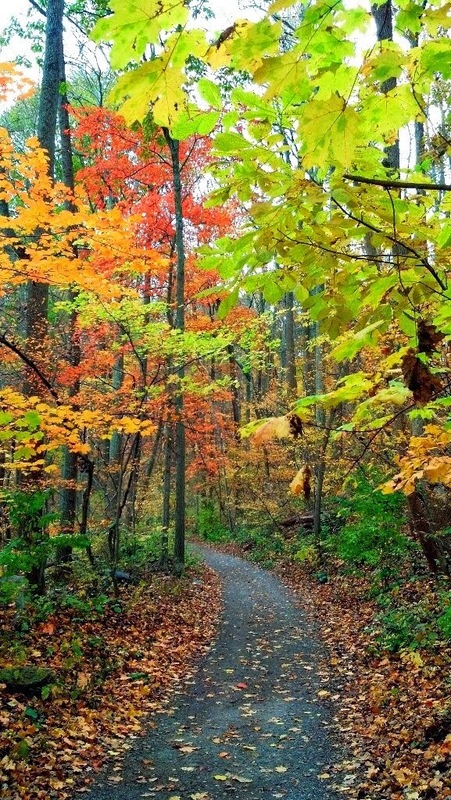 The B and A trail in Glen Burnie makes you cross some busy roads like the one below. 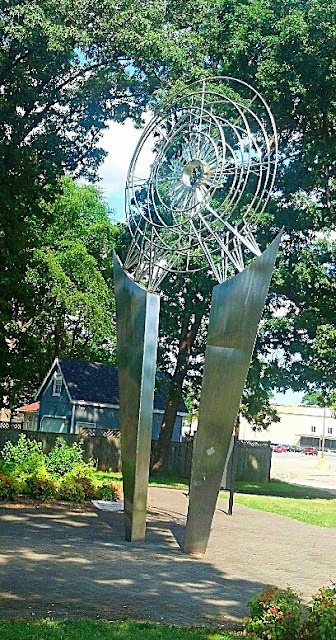 One of the interesting features of the B and A trail is the sun and planet demonstration with representative sculptures. The Sun sculpture shown below starts the demonstration and the sculptures representing the planets are placed in relational distance to the Sun sculpture. 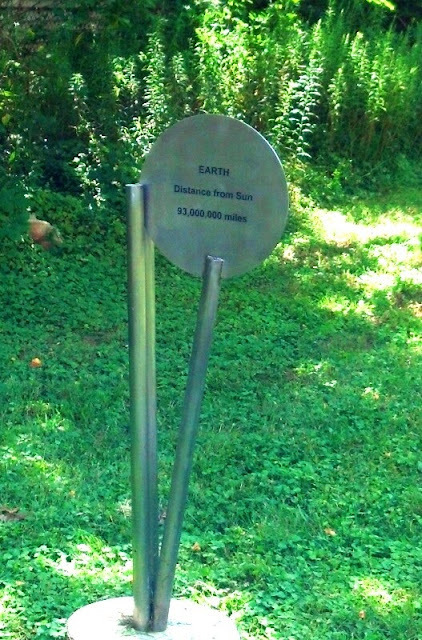 At .07 miles from Sun sculpture is the symbol representing the earth. 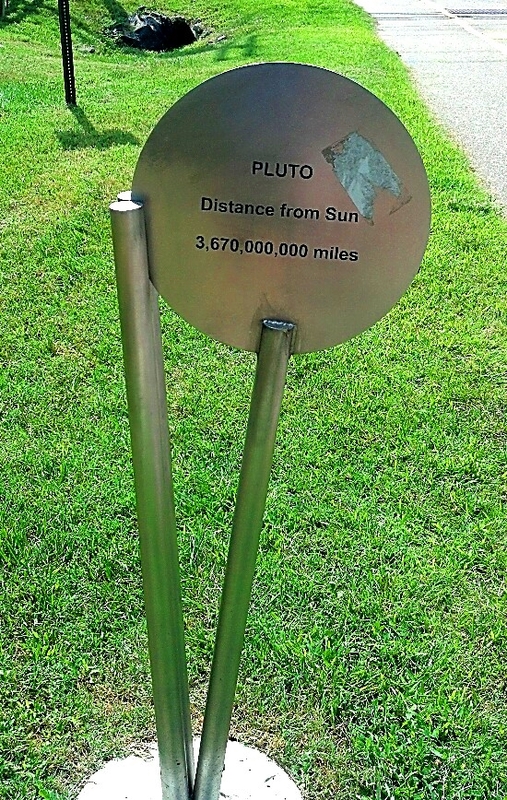 The planet symbols are a short distance from each other until you pass Mars and the distances to Jupiter and Saturn show how far out these planets are. After Saturn the symbols for Uranus and Neptune are each over a mile from each other. At almost 39 times farther from the Sun then Earth is Pluto and over 6 miles from the Sun sculpture. 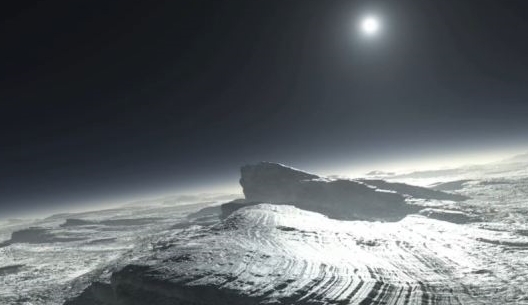 Below is a representation I found of what the Sun would look like from Pluto. What some planets would look like on Earth if they were at the same distance as the Moon. OK-- so what do you do with a tub of tofu?? Cutting back on meat makes so much sense on many levels. A plant based diet has many benefits outlined in the China Study. The environmental benefits of less meat production are also substantial. Finally, a plant based diet would probably help with our obesity problem. Having just spent a week with my daughter and son-in-law who are both vegan I decided to try some meat alternatives. I decided to try a few meat alternatives to see how they stacked up to meat. Tofu was the first thing I tried. I have tried tofu before but it always left me disappointed in its texture and lack of taste. I remembered having some "mock" scrambled eggs made with tofu once and decided to try it again. I found this recipe on You Tube and it made a good substitute for eggs. My efforts are pictured above. 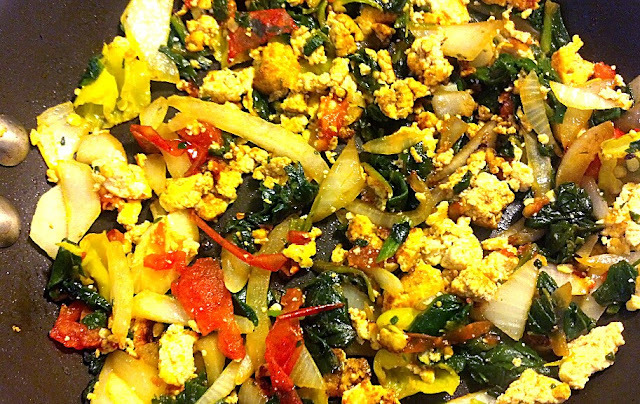 I added tomato, onion and spinach to add even more flavor. I bought the tofu in a big tub at the Lotto Asian Market in Catonsville. Much cheaper than at a regular supermarket. 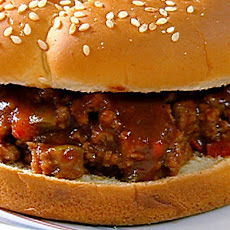 Next I tried some tofu sloppy joes. I found this recipe and added some chopped portobello mushrooms and wine that made the dish even better. This would probably work with spaghetti sauce as a meat substitute. Finally I tried to make some "mock" bacon bits with tofu. After breaking down the tofu and adding some soy sauce and smoked paprika and rolling in some bread crumbs, I fried the tofu in some light oil. After a while I was able to get the tofu crispy. Not exactly bacon bits but it did have a good flavor. I have decided to try and use tofu as a meat substitute twice a week to see if I can move away from meat at least a few days a week. Today many efforts are being made to get more girls to take an interest in STEM (science, technology, engineering, math) courses. Girls have been directed to the "softer" fields that are traditionally seen as the "helping" careers. This is a worthwhile effort to expose girls to areas that haven't traditionally been thought of as "feminine" pursuits. Recently I heard about an entrepreneur who had developed a product called Goldie Blox that will develop girls interest in engineering and science. This got me thinking. Why don't we have any efforts to get boys to explore the humanities, community service and the helping professions? When I was in high school I was only offered advanced courses in science and math and most of my classes were predominantly male. Only being exposed to these areas I entered college planning to major in engineering. I quickly found out that my interest took me to the areas of political science and psychology. Fortunately I discovered this early enough to make the changes and still graduate on time. For me solving social problems and developing programs that helped people was so much more satisfying than designing a building or a bridge. After spending a career in human services I know that most boys are infrequently given an opportunity to identify their possible interest in working with people. Men build things, women help people. That stereotype works to the disadvantage of men as much as it does to women. Maybe with all the problems men seem to be causing in our world having a little more exposure to those "feminine" choices might make the world a little better place. "Columbia’s first dog park is expected to open this fall, providing a great space for dogs to play or relax — and for their people to join them. 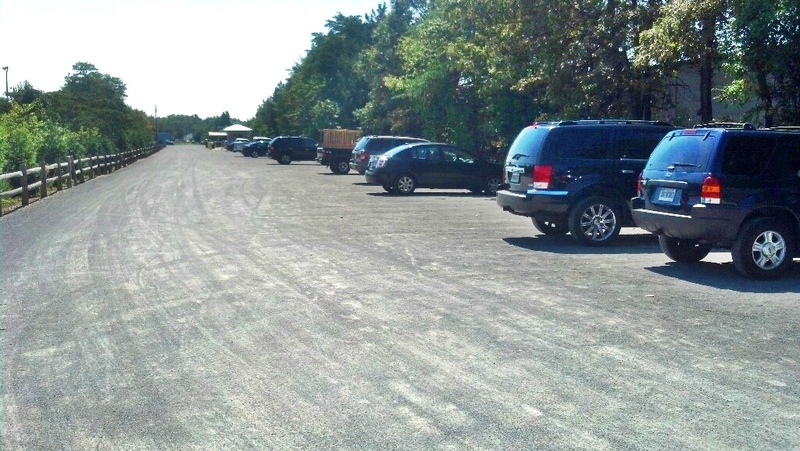 In July, the Howard County Department of Planning and Zoning approved the site plan for Columbia Association’s (CA) Columbia Dog Park. 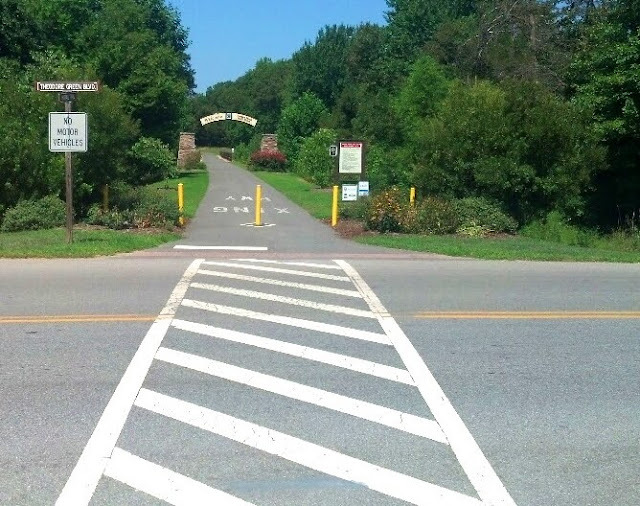 The CA Board of Directors has approved $135,000 in funding for the dog park, which will be located on 2.7 acres off Rivendell Lane, adjacent to the Columbia SportsPark in the village of Harper’s Choice. The Harper’s Choice Village Board has also expressed its support for the project. This will be only the second dog park in a county that has plenty of dog lovers, a community that has made CA’s Dog Day Afternoon a popular annual event. The Howard County Department of Recreation and Parks operates the Worthington Dog Park on Hillsborough Road in Ellicott City, and it is also planning on opening a dog park in Blandair Park in east Columbia. Construction is underway. Most of the features will be complete by late September, weather permitting, and Columbia Dog Park is expected to open in late fall. Columbia Dog Park will have a two-acre area for large dogs and 0.7 acres for small dogs. Registration requirements will be announced at a later date and are anticipated to be similar to those for Worthington Dog Park." This past week in San Francisco I had a chance to go to a baseball game when the Orioles were playing the Giants at AT&T Stadium. As you can see with the guy wearing the Machado shirt above there were a fair number of Oriole fans at the game. The problem was that orange and black are also the colors of the Giants so it made it a little harder to pick out the Oriole fans by just looking for orange shirts. The Orioles were nice enough to pull the game out in the 8th inning and win. What got me thinking about in writing this blog was what happened after the game. We walked back a mile and a half to my daughter's apartment at 11 pm and the streets were full of people. Almost all the people we passed had not been to the game but were just out enjoying the city. Woman walking alone. So why couldn't this happen in Baltimore? We all know the answer is gangs and guns. 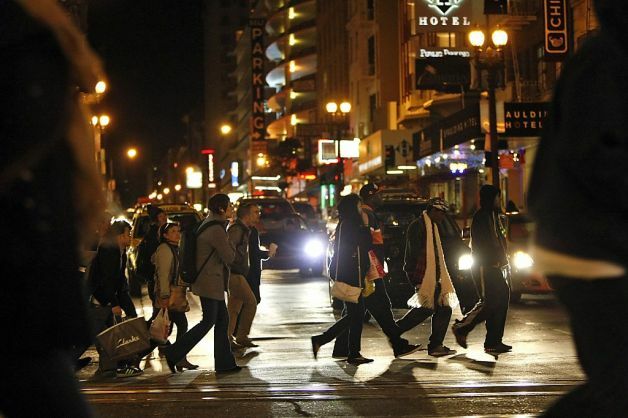 San Francisco has some gangs but has one of the lowest rates of murders rates of any major city. When you watch the news in Baltimore it usually leads off with stories of how many people have been shot in the city. Even attending the fireworks on the Fourth of July in Baltimore can be unsafe according to this news report. Police commissioners come and go, new gun violence strategies are developed and yet nothing seems to be improved in bringing down the murder rate and Baltimore's reputation as a violent city. I don't have any easy answers to this situation but it would be nice to have a city with the vitality of San Francisco close by. Last week I read a story in the Washington Post that indicated that the suburbs may have trouble in the future to expand. The trend is to move to where there are greater amenities and more public transportation options. The days of 40 and 50 mile commutes from the "exurbs" may be coming to an end. It seems that Millennials who were born since 1980 are turning away from the locations their Baby Boomer parents chose. My thoughts turned to the relevance for Columbia and Ellicott City. I wouldn't put our community in the same category as many other unplanned suburban communities that lack the features that define us as "not your typical suburb." But then again our population in Howard County does seem to have a hole in our age demographics when it comes to Millennials. I have blogged about the decrease in this age cohort in the past. It seems that this age cohort declined by 18% from 2000 to 2010. So where are these Millennials going? Some suggest that they are drawn back to more urban settings. This group has delayed starting families and have smaller families. We can certainly see this population gravitating to Federal Hill and Canton in Baltimore. A recent report in the Baltimore Sun pointed out how some of the office building in Baltimore are being converted to rental housing to meet the growing need for rental housing in downtown Baltimore. I am writing this as I am visiting my daughter and her family in San Francisco. This is a Columbia born and raised 30 something who has decided over the past ten years to live in Atlanta, Austin and now San Francisco. 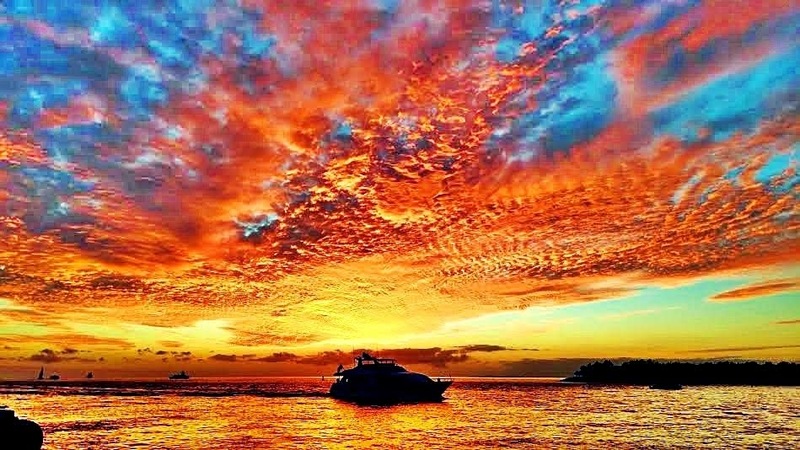 The picture above is her view from their apartment. I have to say it sure beats the view out of our suburban window. 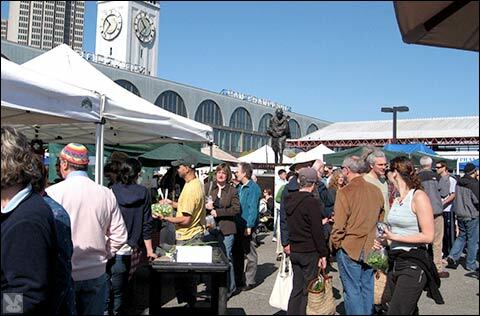 Weekly shopping for their food at the Ferry Building Farmers Market is more fun than running to a Giant. They have 120 restaurants to chose from within one square mile of where they live. We usually walk from her building to the restaurants we have gone to when we visit. 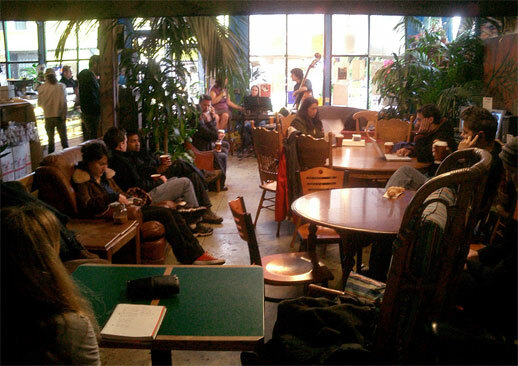 The coffee shop around the corner pictured above, with great coffee, is a great people watching place. Not surprisingly our daughter has high school friends from Columbia who have chosen to live in Seattle and Chicago. Friends of our other children live in Charlotte, Boston and Orlando. Columbia's Millennials show up all over our Country. The good suburban school system we have in Howard County may not be as much of a draw with the rapidly developing online educational options. The neighborhood school may not be as much of a factor in determining where you live if your children receive their education online. Now our other children have not chosen the urban life as much as their sister but none live in Howard County because of the cost of housing here. They would love to locate in the County but find housing in surrounding counties more affordable. The housing planned for the "new downtown" seems to miss the mark on affordability for many Millennials who grew up here. I recently had some time to go to the Columbia Archives to read a copy of the 1960 Howard County General Plan. 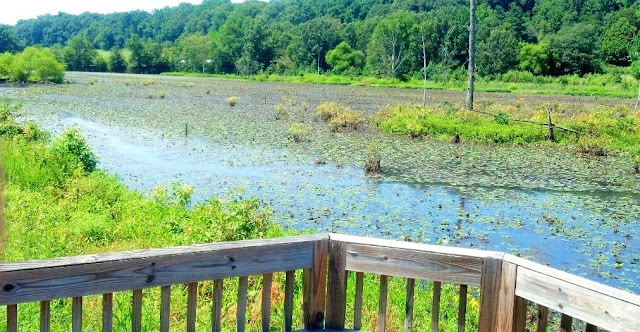 This was a time when the County planners saw the growth in the County but still had no idea that a developer by the name of Jim Rouse was looking at the County as the location for his vision of what a planned community should look like. 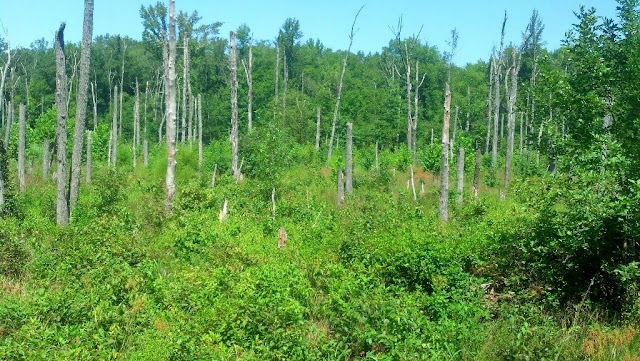 At this time only 11% of the County's land was labeled as developed (18,267 acres out of a total of 160,640 acres). 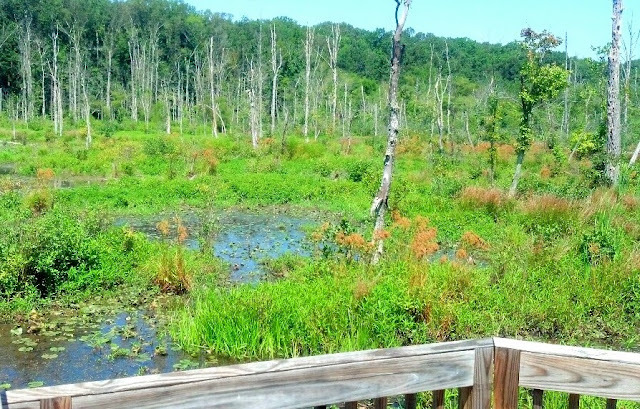 The planners projected another 20-22,000 acres to be developed by the year 2000. Columbia's acreage alone is 20,500. With the spill over development from Columbia we can be sure that the developed acreage of Howard County in 2000 was substantially above the 1960 projection. The population of Howard County had begun to rapidly increase in the 10 years preceding 1960. The population had increased 56% during this ten year period from 23,000 to 36,000. The number of building permits issued had increased from 292 in 1950 to 523 in 1960. The population projection in 1960 for the year 2000 was between 220,000 and 260,000. The actual number in the 2000 Census was 248,000. The view of the County planners in 1960 was still that for large retail development Howard Countians would still travel outside of Howard County. The plan didn't envision a large retail mall in the County because of the existence of the Westview Mall in Baltimore to the north and the Laurel Mall to our south. The plan did envision community sized shopping center of 120-150,000 sq. ft. The reality today is that the square footage of the Columbia Mall is 1,400,000 sq. ft. and plans are for another expansion. The number of retail establishments in the County in 1960 was 346. The Columbia Mall alone has over 200 stores. The area that the planners missed by the largest amount was their estimate of median income. Their estimate of the median income for 2000 was $10,400. The actual income was in 2000 was $85,000. Some of the inaccuracy of income projections in 1960 was the misunderstanding of how the development of Columbia would bring in a population of highly educated professionals. In 1960 the projected growth in employment in the County was seen in mostly manufacturing. Many of these jobs were blue collar in the areas of food, lumber. paper, plastics, fabricated metals, machinery, rubber, paint products and the trucking industry. While the Applied Physics Lab had moved to the County in the 1950's from Silver Spring the impact of the development of the National Security Agency and the growth of the Federal workforce were unknown in 1960. In 1960 the school system in the County was much smaller with only 6985 students. Today we have over 50,000 enrolled students. In 1960 there was one senior high school (Howard High), two junior highs, two junior/senior high schools (Glenelg, Tubman), two junior highs and 13 elementary schools. Today we have 40 elementary schools, 19 middle schools, 12 high schools and 3 education centers. In 1960 it was envisioned that the County might develop a junior college to serve county students. Community colleges were not developed in 1960. Today the Howard Community College enrolls 13,000 credit students and 16,000 continuing education students. The rural Howard County of 1960 needed only a small police department. There were 11 police officers in 1960 which was an increase from 3 in 1950. There was only the Ellicott City police station. It was projected that the County would need 60 policemen by 1980 at 4 police stations. Today there are 445 police officers and 189 civilian employees. Other 1960 service projections- 10-12 libraries by 2000 and "a hospital in a rural, pastoral setting to encourage healing (especially for mental patients)" A "Children's Shelter Center for abused and neglected children" which didn't foresee the development of family foster care. As a former foster parent to many teenagers I know first hand the challenges these youth make in transitioning to adulthood. With many of these youth coming from homes where they have been neglected or abused they are vulnerable to anyone showing them any attention. Too often the ones showing them this attention are predators looking for vulnerable children. In my estimation these predators are the lowest form of humans. Having said that it is a reality that many of these predators were abused children themselves. Today I want to mention two programs with which I have had experience that are working with these youth to provide the necessary support to make this transition to adulthood and avoid the predators. Fostering Futures is a Howard County program out of the local Voices for Children office that works with youth in foster care in Howard County. This program targets youth who will be aging out of foster care. Consider being on their volunteer network. Save the date of September 20 for their fundraiser The Vintage Affair. They are also signing up CASA volunteers for their September training. It is one thing to read stories like the ones mentioned above and think "Those poor children" and it is another thing to take action in some meaningful way. I would ask you to consider contributing to either of these programs. Aaaaaaah August! It happens every August. Does anything productive happen in August? What reminded me of this was seeing how Congress was clearing out of town last Friday. Talk about not deserving a vacation. I know that in Europe everything really does shut down for the whole month of August. Every year this European model seems to be a model that we are also adopting. I have nothing against slowing down and relaxing for the month and recovering for the more hurried place once September starts and everything starts to kick in again until the Thanksgiving to New Year period. Traveling around on our roads at rush hour is a joy in August. Tomatoes are starting to ripen and salads are so much better this time of the year. Crabs are becoming more plentiful. Eating outside in the evening with the birds in the background is so much better than inside in the cold winter. In our family it seems as if everyone has a birthday or an anniversary in August so I stock up with cards at the beginning of the month. Apparently August does have the most babies born of any month. I remember a time in our family with kids at home when August was not so relaxing. Getting school supplies and clothes, driving to the beach for hurried week of sun and sand before the kids had to get back for fall sports that started their practices in mid August. I don't know how many times my wife or I would say to each other "someday we will not have this craziness!!" So why do we call up our grown kids and ask when the grandkids can sleep over again?! Sometimes August is just too slow for empty nesters like us. Living in our high income community you maybe surprised at the number of children who will be returning to school this month without the necessary school supplies because of the cost of those supplies. Many of us remember a time when school supplies were all supplied by the schools. With tight budgets many schools now require parents to buy these supplies. This can be a burden for many low income families in our County that struggle to afford the costs associated with "back to school." We not infrequently hear of teachers buying the school supplies for students in their class who come to school without those supplies. Just because we don't directly see this problem, as the teachers do, doesn't mean that we should overlook this need with our students.
" Many of you know it as 'The Backpack' program. PFS was started locally 12 years ago when Mike Clark, the former Baltimore Sun reporter was directing Christ Church Link, a ministry of Christ Episcopal Church. Mike observed the large number of students who were returning to school without adequate supplies. 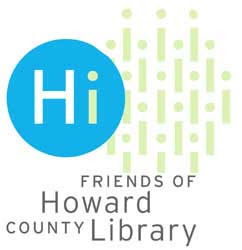 Twelve years later the effort has morphed into a formal partnership among PFS, the Community Action Council, and the Howard County Public School System. PFS supporters include a wide range of individuals, businesses, churches and civic groups. 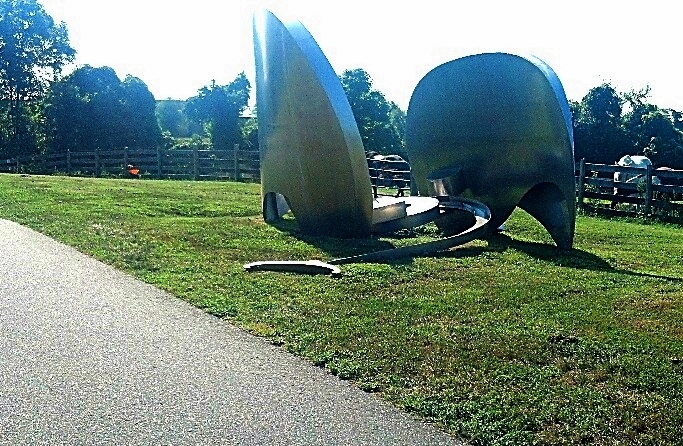 For example, one of the largest supporters is the non-profit, Howard County Summer Theater. Each year they share a major part of their proceeds with PFS. If you purchase extra school supplies you can look for the donation box at all Howard County Libraries and all Columbia Village offices. If you want to make a donation, PFS can supply a student with a new backpack and supplies for just $25.00 per student. 100% of all contribution go for supplies. Here are the direct options for helping:"
Community Action Council, 6751Columbia Gateway Drive, Columbia, MD 21046. You can learn more at www.prepareforsuccess.org. Howard County was on the leading edge of providing health care to its citizens with the development of the Healthy Howard Program begun in 2009. There has been a recognition that County citizens were without health care coverage for a variety of reasons. Many worked for companies that didn't provide health care coverage, some were unaware of health care programs they could access or they may have had too much income for some of the public programs. Healthy Howard was designed to increase the awareness of the programs available and to provide access to health care for people who found themselves ineligible for the most common programs such as Medical Assistance, Primary Adult Care (PAC) and Maryland Children's Health Program. In 2012 of the 6000 people who were screened about 4000 or two thirds were enrolled in one of the health care plans. In its initial year of operation the health care part of Healthy Howard enrolled 515 members. Enrollment was on a monthly basis so members could stop enrollment any month. Of the 515 members, 333 remained members at the end of the first year. The health care plan partnered with a variety of health care providers to provide their services pro bono or at greatly reduced fees. Some of these partners were Howard County General Hospital, Chase Brexton Health Care, American Radiology, Cardiology Services of Central Maryland and Wilmer Eye Institute. With the passage of the Affordable Health Care Act (i.e. "Obamacare") Healthy Howard has begun its transition out of the health care delivery component at the first of this year. No new members have been enrolled since the first of the year and the existing members will be transitioned to one of the health care insurance plans under the Maryland Health Care Exchange. Enrollment in those plans will begin October 1st and the new coverages will begin January 1. 2014. Maryland has been one of the most active states in getting its health care exchange up and operating in a timely fashion. Maryland has also agreed to accept federal dollars to expand the eligibility for Medical Assistance to increase the number of people eligible for this program. Unfortunately, other less progressive states have shortchanged their citizens available health care options for political reasons. Not surprisingly many of these states have some of the highest levels of uninsured residents in the Country. As Healthy Howard transitions from offering a health care program it will develop a new "Connector" program in 6 Maryland jurisdictions. It was selected for this role in a competitive process. The jurisdictions are Howard, Carroll, Washington, Allegany, Garrett and Frederick. This is a role that they have been providing in Howard County since 2011 in its Door to Health Care in conjunction with the Howard County Health Department. The Connector program will partner with 12 different organizations in these jurisdictions. These partners have connections with the people who are most likely to need enrollment in the various health care options. Examples of these organizations are local Health Departments, Departments of Social Services, Community Action Agencies, libraries and faith based organizations. As mentioned above many of the states with the highest number of uninsured residents are the ones with the most opposition to the Affordable Health Care Act. Not surprisingly Massachusetts with its "Romneycare" has the most residents with health insurance. Maryland is number eight for enrollment. Worst states are Texas, Oklahoma, Florida, Mississippi and Alaska. Want to know how "Romneycare" is doing six years out? Click here.